I’ve been drinking Tequesta Brewing Company beer for a while (you can find their Der Chancellor Kolsch beer around town at quite a few locations) but had never visited the brewery and tap room. We headed up to Tequesta to check it out and grab a bite to eat. The tap room is dominated by a long bar running down the right side of the space with a few high tops across the way and a leather couch lounge area in the back. 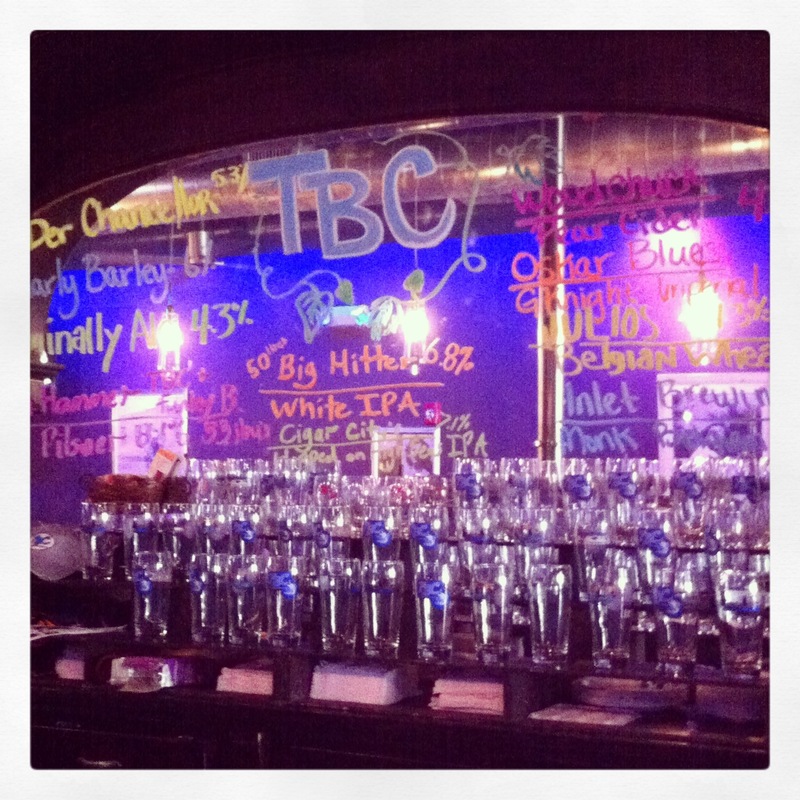 A large mirror behind the bar broadcasts the day’s offerings including some other local breweries’ beers. Dark blue lights highlight the tanks in the back. There are some pretty cool details about this place that I really like, down to the beer tap faucet in the ladies’ room. We were some of the first to arrive for the day as we came fairly early to have lunch. We debated eating at Corner Cafe and then coming over, but instead decided to order from their limited menu for delivery. It’s pretty simple – call them up and tell them your seat at the bar and your food is brought over a few minutes later – easy peasy. I’m glad we got there earlier because it was neat to watch all the regulars and newbies wander in, either yelling hellos and hugging the bartender or timidly eyeing the space and trying understand how to order food. Next time, I will feel like a total pro. They also had a handful of growler refills move in and out while we were there. This is clearly a place that’s been embraced by its community and built up a loyal following. I love visiting local breweries because I feel like I always end up going outside of my comfort zone and trying new things. I’ve had Chancellor a bunch and know it’s an easy, consistent pick.. so I went for the White IPA. I liked it a lot. It had the hops flavor but was still smooth. I also tasted the “Polish Hammer” Imperial IPA they collaborated on with Funky Buddha. That thing was no joke – very strong with a high ABV. A little intense for Noon, so my next glass was a Julio’s Hefeweizen instead. It was a Belgian Wheat and served with an orange slice, similar to a Blue Moon. When we voted for which beer to get as a growler, Julio’s got my vote. We ended up getting the White IPA to go. I even like the way they do their growlers. We ordered ours while still seated and they made it and put it in the fridge by the door for us to grab on our way out. Our bartender was Tom and he was a lot of fun. Check out his Spotlight HERE. It’s nice chatting with the guys because they know the beer so well. They brew it, so they really understand what they’re serving and have a passion for it. About the food. I went with the Cuban Sandwich. It was really good with a nice roasted pork and champagne mustard and came with house made chips which are always a personal favorite. Andrew went with the Hamburger which looked good and he seemed to enjoy. The menu isn’t overly diverse being a limited menu from next door, but it definitely does the trick.